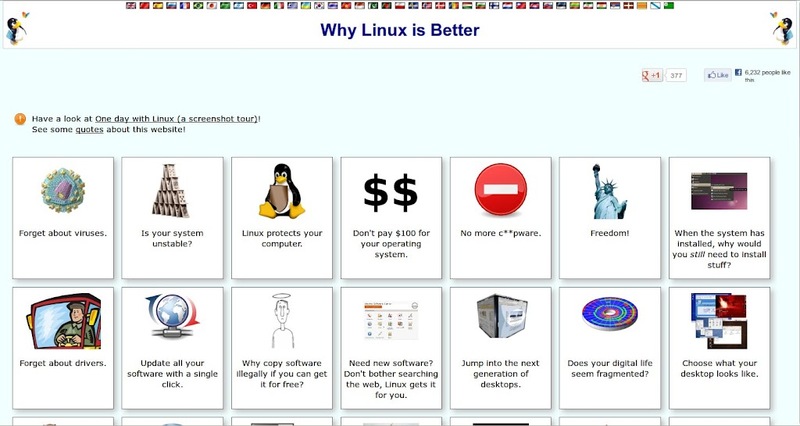 I may be preaching to the converted here, but care of Full Circle Magazine Issue-62 (June 2012), I alighted upon the site Why Linux is Better (whylinuxisbetter.net), created by Manu Cornet (profile on Google+). Now you can just point people to the website instead of having to explain, for the hundredth time, why Linux is better (for most things). A very simple flat HTML site, this is one of the best ways I know to spread the word on free software, and could be a masterpiece in Open Source literature. The tone and style of the writing makes for a good read, informative yet light, despite the self-depreciating reference to Manu's English. Short but comprehensive, partisan but not too much, the main page goes through the points in favour of Open Source, each opening onto a separate page of more detailed description. The One day with Linux screenshot tour is itself a mini-masterpiece. Don't pay $100 for your operating system. When the system has installed, why would you still need to install stuff? Does your digital life seem fragmented? Choose what your desktop looks like. Do something for the environment. No back doors in your software. Enjoy free and unlimited support. Too many windows? Use workspaces. No big mess in your start menu. Don't wait years for bugs to be solved; report and track them down. Are you tired of restarting your computer all the time? Let your old computer have a second life. Help other countries, and your own. Use MSN, AIM, ICQ, Jabber, with a single program. Get a great music player.